Heather and some of our San Antonio bead friends are planning to meet up first at Ann Pearce's bead shop for a Bead Soup Party! This is what we are bringing. 1 16" strand of beads in teal, blue, green or brown to share for our "bead soup" 1 clasp and stringing material. focal bead basic tools. We'll throw the beads in a bowl and scoop them out to each of our guests. We'll have two hours to make a necklace or bracelet while we chat, laugh and have fun! 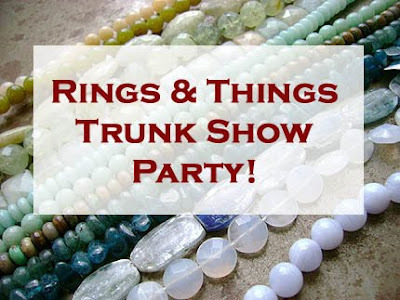 Following our little soup party we'll head over to the Rings & Things trunk show for some serious bead shopping!!! I will be in San Antonio visiting Heather, (humblebeads) so come out visit with us at the show and catch up! Oh, I do wish I were closer. But that is the week that we head over to Santa Fe. Have fun! I would SO be there with you guys, but I am going to be in the Bay Area for Beading by the Bay. I would love to see you and hang out, but it looks like the timing's just not right on this one - I miss you guys! LeAnn, Erin and Katie, It would be so much fun if you could join us. Heather and I will keep you with us in spirit. I'm not sure I'll be working at the San Antonio bead show, but it sounds like our crew is going to be met by a group of very happy beaders. Enjoy the bead soup for me! Dave should we introduce ourselves to the staff as the "Bead Soup" girls. Or will they be able to spot us laugh and drooling over the beads!